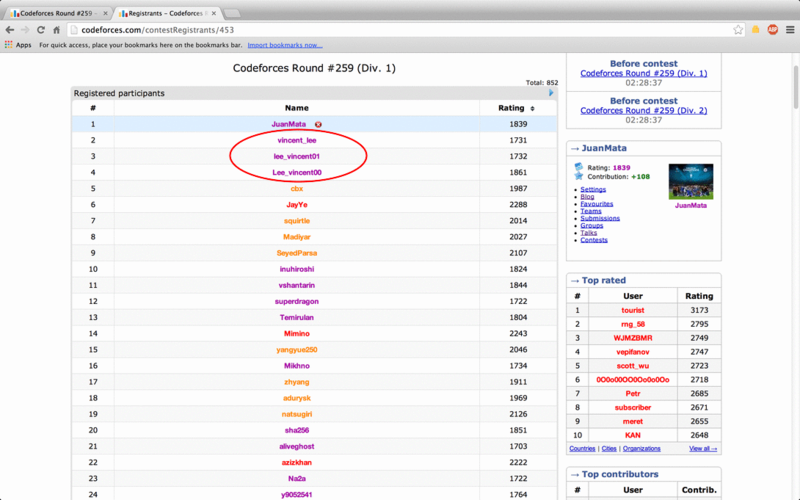 Codeforces Round #259 (Div. 1 and Div. 2) will take place on August 1st, 19:30 MSK. Setters are: sevenkplus, xlk and me. Testers are: vfleaking, GuyUpLion, ztxz16 , CMHJT and Trinitrophenol. Many thanks to Gerald for his help in giving advise about the problems. 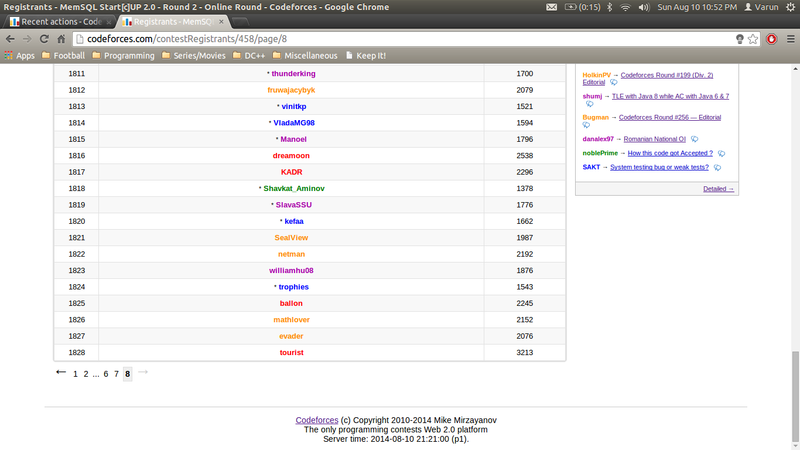 And we gratefully acknowledge MikeMirzayanov and his team, who bring us the world best competitive programming platform! Tonight, you will come to Equestria and help our Friendship Princess — Twilight Sparkle to solve those intractable challenges one after another. Twilight Sparkle is a main protagonist of the series — My Little Pony: Friendship Is Magic. She is a female unicorn pony who transforms into an alicorn and becomes a princess in the third season of the series. She has a cutie mark of a 6-pointed magenta star with a white one behind it and 5 more smaller ones at each end of the magneta star. In Div. 1, scores for each problem will be 500-1000-1500-2500-2500. Of course, we guarantee knowing those background storyline and setting won't help you to solve any of our problems. A pedantic note: I think you should instead guarantee that not knowing the setting won't hold you back from solving these problems. The reason is knowing this particular background might bring to your life some friendship which -- as we all know -- is magic. And noone should doubt that magic can help them solve tough problems. Maybe they're going to do a rampage. I don't know whether it is also that popular in other countries, but in Poland it is very common to name function returning least significant bit a "MAGIC". So, are you suggesting that this function will help? Maybe some Fenwick trees :P? I hate this n&-n thing xd. That is very strongly depending on system of representing it in a computer. Everyone who knows what is a binary system can agree with my version but to get your version work we need some kind of weird arrangement how to represent negative numbers and fact that it's working is rather a funny coincidence. n&-n is easier to remember, but n — (n & (n — 1)); is easier to come up with on your own and much more reasonable in my opinion. Your argument is true but almost all softwares&&hardwares use the same way to represent negative. So using n&-n is OK i think. And more important n&-n works faster and because it's a very basic operation, say in Fenwick trees this trick proved to be helpful. In China, It's called the lowbit. Deducing from that style of coding — is his rating greater than 1500? I wouldn't expect that :P.
In many cases, the background is related with incredible and strange story. Thus, I always drop into puzzled condition. Are those collector's items? Or diy things? Wait, just one pwny? You guys haven't figured out how to stack pwnies like how you stack cows yet? Maybe they want to create more contests like that :P.
let us see how long they can keep it going! I won't solve these tasks if Rarity doesn't appear. Python haven't helped me. Maybe, these problems are better to solve with FiM++. Or with better brains. The tambourine with ponies hasn't helped me too. Maybe, my place is in Div2. For the glory of satan of course ! Oh yes!! There seems to be MLP FiM problem set! I'm looking forward to compete this round as Equestrian (see my profile). What is "MLP FiM" short for? Seems to be My Little Pony: friendship is Magic. Why don't you try to look on the bright side? It would be so great if start time of this Chinese-author round were to changed earlier to usual Chinese round time 21:00. Firstly — next Chinese contest, secondly — brony contest. Gotta get outta from here xD. I won't be surprised if I see 5x3000 pts :D.
OK, show them some mercy. Problem A may be 2500 pts (Div1) only. My daughter loves Twilight Sparkle. Every night I have to watch My Little Pony with her. I hope to get a good result in this round. I would like to show to my little daughter that my name has the same color of her Twilight Sparkle. Good luck & AC for fun! Going to participate in the Div. 1 contest for the first time! Want to have a good experience! May the Almighty help me and all thanks goes to him! Feeling happy to see that! Congratulations! I should be in Div 2 from next contest, but I could not even get a chance to submit a solution! Had no idea to make a solution. It seem to appear problems as "the one that don't know ******(an algorithm name) will FST!" The one, who don't know ***, won't pass the pretest. I think Chinese problem setters are supposed to adjust the start time to fit Chinese participants even if only in one round. Still 0 vote? Well, poor Chinese deserve it. xiaodao and I often go to bed late (2:00 AM ?) and get up late (10:00 AM ?). It's typical Chinese Round! God bless us. =.=,Why the contest is so late? Why can't I register for Codeforces Round #259 (Div. 1)? Your contest rating must be above 1700 in order to register for Div. 1 contests. Div 2 (especially Chinese Round Div 2) is more suitable for you. It seems that setter xlk and tester GuyUpLion are the same person. Maybe I'm wrong, but their names are Ke Bi and they are from Shijiazhuang. They are definitely different people. Just one of them didn't tell us his true name. Hmm, I guess one of them is Ke's girl friend. Thank you for not guessing one is Ke's boy friend. If you use your true name, I can also register the same account as you. It's a typical Chinese round. What is the characteristics of a "typical Chinese round" ?? Hard problems (usually due to hard math) and weaker pretests than usual. This time our pretests seem to be strong. Hope me can finish 2 problems in this round! i just registered for this contest, and guess what i saw! i think these three accounts are all the same person, and if found out they should be banned! EDIT: it appears that the "real account" of this person has commented on OP about 10 minutes ago. Извеняюсь за вопрос а эта строчка егодня вам придется посетить Equestria и помочь очень дружелюбной принцессе, Twilight Sparkle, решить несколько задачек. такая и должна быть? the magantastar and the white star are going ot perform magic for the sake of gearld. Grey? Where? #EDIT: Found it. Maybe that will be helpful for the setters to judge whether the Div2 problems set by them are of proper difficulty and not too difficult. tourist is the last registrant, thereby marking his name for all to see in the next 3ish minutes. I am going to sleep. Remaining problems is very hard. what if one of ur Pretests passed submissions gets Hacked? A trade-off between early sleeping and submission's safety. looks like you made a good choice. all ur submissions got Accepted. DP[i][mask] for each i = 1 .. n calculate min answer from 1 to i by using mask of prime numbers. if we choose for b[i] not prime number we can call b[i] = p[x1] * p[x2].... so it's mask of primes. Oh what a nice solution. I was thinking of a completely different Solution 7320838 during contest. dp[i][mask] is the answer for the first i numbers if the numbers we used divide only the prime numbers from mask. Here is a short explanation. You have to notice that it is a Bitmask DP problem. There are 16 primes less than 58. So keep a mask of 2^16, representing the primes used before. Then start a dp with states dp(pos,mask). In each position, you can place from 1-60. You can however only place a number if and only if it contains primes that have not been used before. Otherwise you can get gcd > 1. Just take the minimum configuration. Later print your path. But you can't choose 100 pairwise primes less than 58. Don't downvote if I'm wrong. We are all here to learn. Edit: NVM, forgot about 1s. You were just simply looking at power function. I was using power function differently. My code has expressions of the form pow(x/y, n). It would have failed if I would have done pow(x, n) / pow(y, n). We generally don't use pow cause of precision error. But since we are working with double here and the judge is going to ignore 10^-4 error anyways, I guess precision no longer becomes a issue anymore. I managed to hack cause they were trying to find pow(10^5,10^5), which is a large number and will given INF or NAN. It depends on how one uses it. I used pow as well. Except I had pow(x, y) only, where 0 <= x <= 1, which is why I don't get overflow, unlike if I was to use pow(m, n). but what i mean is, doesn't pow(x,y) take to run? I think it is doable in O(log y) time. i know we can implement finding in . but i was referring to the pow function provided by <cmath>. ...so a coprocessor (in short, a part of processor that conducts some funny operations, including computations on floating point numbers) needs to do exp (ex), ln ( ) and mul (x·y) operations. Each of them can be done in a matter of dozens of CPU clock ticks. why do you expect pow function for fail ? Yeah... python can handle pretty large numbers, but it's still slow working with them. That's why you get TLE's if you do the unsimplified formula. How to solve Div 1-A? The probability that no value is bigger that x is equal to . It means that probability that max value is equal to x is equal to (probability of not getting >x) — (probability of not getting >x-1). Then you can compute the expected value. I got the formula...But I could not translate it into code..as the constraints were too high. Programming languages usually have a routine to compute the powers of floating-point numbers very fast. You can assume it works in constant time. C++ has a useful function: pow(base,exponent), which is fast enough. could you explain this simplification? There is a chance that maximum will be ≤ k. Consider sequence 1, 2, ..., m: probability for each k to be the max is minus probability that every less value would be the maximum, so . Then multiply by value to get the expected value and you should get something along these lines. Sorry, duplicated and deleted. See below. Since, p <= 1, pow ( p, n ) will not overflow. pow ( m, n ) however will overflow. firstly, the code is submitted by Ac-93 himself. secondly, he is not invoking those functions anywhere in main. i don't see anything wrong with having segment tree implementation as part of one's template. Thank you for the contest and for the great tasks! If I would give feedback on the tasks, I would say that I disliked that the graph is not guaranteed to be connected in Div1 C/Div2 E. This, in my opinion, was a restriction with a single purpose in mind — let's invent some edge cases, which is the purpose I heavily dislike. If the graph is connected, there are no edge cases at all (and it is always possible to construct a path). Now, because this is not guaranteed, I had to add a bunch of "edge case" code — find out which vertex to start DFS from (rather than starting from any with single component), check if there is only 1 connected component etc. With a single component I felt that the task actually had short and clean solution in code. Was it really necessary to do this? Furthermore, because the authors didn't include any test with answer -1 in pretests, I had wasted an hour worth of points before someone hacked me and I found the lack of outputing -1 in my code. Sure, this is completely my fault. But one of the point of pretests is to check the format of the output (like if there are mutiple possible string outputs — have them all in pretests), and in this case -1 was never tested. Is it fair to penalize people who accidently mistyped this constant? I don't mind the possible disconnectedness, especially because the "if there's no answer" in the statement worked as a good hint, but the pretests definitely should've taken care of that. I also didn't really try hacking C because I thought the only special case was included in the pretests... I wonder how many people were in a similar situation. Yeah, I didn't paid too much attention to the hint "if there's no answer", because I see authors putting this in even if there is always solution, to hide that fact, because it might make the task easier. But to highlight my point about disconnectedness, here is the difference between my original code and the accepted version. Sure, it certainly doesn't make the task bad — I liked it very much, but this code was in my opinion unnecessary and brought nothing to the solution of the task except edge cases. Before the whole code was: read the graph, run DFS, output the answer. Now we have extra steps: find the vertex to start from, check that there is no 1 in array after DFS. And yeah, there were different approaches to this problem, in which having unconnected graph only brought 1 line modification. My modifications were much simpler, it's mostly just rewriting "0" to "i" in a big chunk of code. I think you missed an "i" in the expected value expression. Please can anyone tell me how do I post mathematical symbols here ? Saw the same error again (here). No that's not why I coded it wrong . I took summation from 1 to m but did not merge the denominator: m^n with the numerator . Thus I thought that it would overflow and did not do anything about the problem . Task C is good, but I think it would be better to set that the input graph is connected. (The other part is not very interesting). Task D is also good, but I think the TL is a bit tie. I managed to pass the pretest by code optimization. I think it is not a good idea to use it here since it has already used in previous contests. For example, since I know I can't even code solution for the eaiser task, I just skip this task and focus on D, it gives me some advantages. Overall it is a good contest, thank you all writers and testers! And this is why I disliked the absence of this restriction in the first place in the comment above. The whole idea in the solution is run on a single connected component, then you added unnatural expansion (unnatural to the solution rather than unnatural to the statement, and I probably don't even agree that this constraint in the statement is unnatural) to allow graphs to be not connected, so that there are now some edge cases/extra work to do. And as you wrote Egor failed because of this. Seems to me that you're pretty happy with that. I believe authors should be happy when people fail their task with a wrong solution, rather than solving it correctly and failing on the edge case. But maybe that's just me. Don't get me wrong, I still liked the task and the contest. As cgy4ever I just feel it could have been even better with that restriction. Sometimes we need to left something to hack, and sometimes we cover the tricky part by constraints or give such case in examples. For me, I only left it to hack if the task is very easy or a bit classic. If I'm the writer of this task, I will cover that trick cases, because this task itself is challenging, if someone get the solution but fail by that stupid trick then it is huge lost (Getting the solution is a challenging thing, so he should get points by this). It's all about connectedness, so it doesn't matter. I know it is bad, that's why I put it in the middle night~ Princess Luna, can you hear me? Slowest system testing I've ever seen....only 4 submission are being judged at the same time! I am amazed that you have done 62 contests but haven't seen slower system testing. The system testing is slow because there are too many test cases for problem A. We apologize for this. there cant be more that 50 cases! I was right because I gave up and slept early. Honestly, I would disagree with the statement "very hard problems", at least with E. It was pretty complicated, I must say, but if you carefully broke down the problem into smaller ones, it became quite straightforward (i.e. no superclever observations and tricks were needed), although implementationally demanding. Of course, it is only my opinion :) And I didn't manage to find a (obvious) bug before the end of the contest, but still it was not "very hard". let prob[i] be the probability that the max number is i (for all i from 1 to M) then I compute the expected number. let dp[i] be number of sequences with length N and every element between 1 and i and max number is i. But I couldn't implement it because I don't know how to avoid overflow of dp[i] and (M^N). is there anyway to implement this idea or I should search for another idea that is easy to implement? Here is a code for my idea it works correctly for small tests. This is not the first time that I encounter a probability problem that I could find a solution to solve it but I couldn't implement it. my submission for problem E (Div 2) is giving WA on pretest 4.But when after the contest i tried the test case it's giving correct answer on my system as well as ideone. can somebody tell me the reason behind it ?? Can't see any differencies, there's the same (incorrect) answer at ideone, isn't there? ohh i am extremely sorry i didn't know what i was thinking. I misinterpreted output for the answer in the submissions. Sorry for the trouble and thanks. i saw a few AC submissions in my room for Div-1 A, which printed . can anyone please provide a proof for this? Am I too dumb or is it really not that obvious how the left hand side can be rewritten as the right hand side? JuanMata i don't think the limit of summation will be till m, it will be till m-1 and also instead of first term m+1 shouldn't m be there? Have a look at this comment. http://codeforces.com/blog/entry/13247#comment-180671. If you simplify it, it will result in your formula. In formula by JuanMata the summation is till m. Notice that the last term is (m/m =1) so it will cancel the previous 1 . This will leave the formula given by exmath89. PS: There is a small typo in you formula , the summation should be till m-1 not n.
For Div.2 problem B: http://codeforces.com/contest/454/problem/B My Submission: http://codeforces.com/contest/454/submission/7316030 It fails on pretest 6. If I'm right, here is an equivalent test: 5 4 1 2 3 5 How this array can be sorted using the given move? If my test is not equivalent, please update me with a correct one that I can trace. Thanks. I dont think that it is equivalent. Here is a test case which your code fails. 3 1 2 1. How to solve Div2-C ? Look at exmath89's post for the expression to evaluate. To evaluate this expression, for everything in the summation, calculate it with exponentiation by squaring. Then, sum these up and subtract from m to get the answer. Yes but i was not thinking of The STL implement, i thought its Linear so it should fail. I mean my testcase should do some hacks to make STL deque Linear in case of hacking this submission. It was a bit unusual for me. STL is evil in some way... Believe me, after IPSC 2014 there will be "HashSetKiller" programs, like already exist JavaQuickSortKiller! I will check more in the STL implements. I was 45 minutes late, but still +71 rating.Thanks for great problems. Forgive me if I'm a bit retarded in that subject, but were 50 points always deducted for submissions that fail on a sample test, but not on a 1st test? I thought that rule of not deducting 50 points for submission failing 1st sample test applies to all samples. It applies only for the first sample, I can't get the point of this though. it is mainly to check that output format exactly matches with what the checker expects. this is especially useful in problems like this one. This way you are not penalized in case of your submission failing due to wrong output format, or if you simply chose wrong file to upload/ wrong problem to submit against. Completely agree with you. In this contest, I got two WA on pretest 2 in div1C, which was one of the samples, directly costing me 100 points. The point is that you should test the samples. The reason why first sample isn't penalized is I believe to avoid penalties for technical stuff (like how to deal correctly with packages in Java, for example) rather than avoid penalizing for WA1. Someone please tell how to solve div1C? May I ask you to do your next contest in "Adventure Time" setting? It's very nice too :). Following this success, I will make my next round with Pokemons! Thanks for the awesome problemset. Unfortunately I missed this round :-(. Thank you xiaodao for your contribution to the community. +122 rating. I love ponies, also this is surely great contest! The new Editorial is available here. Can you give me solution for this round? Thank u.
Div-2 A solution using regexp (language: Perl): longer, shorter. Server time: Apr/19/2019 01:35:42 (f2).